Without placing boundaries on what services we can provide, Online Ryugaku Support Center Education Network concentrates on giving each individual student the kind of study abroad information that they really need. ALC International and Online Ryugaku Support Center have come together to form an exiting new kind of study abroad agency. 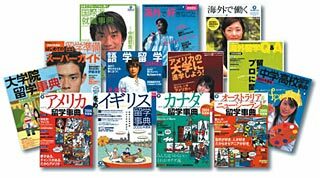 To begin with, the ALC group has a profound history of supporting independently minded students wishing to go abroad through their SpaceALC website and publications such as Ryugaku-Jiten (study-abroad guide). Online Ryugaku Support Center, though a fairly young company, has already won an outstanding reputation among students for offering reasonable yet superior study abroad services. We provide remarkable student support such as free registration services for language and vocational schools (with the exception of Chinese institutions). ALC Press was established in 1969 with the idea of creating a global network for communication among individuals and organizations involved in education and intercultural exchange. We dreamed of creating a company unique in the world. Our business activities include: publishing magazines and books focused on language study; producing multimedia educational materials; providing informational websites and a language study portal site (primarily for study abroad counseling and application processing support). Established in 1999, Online Ryugaku Support Center set out to create a more 'student friendly' type of study abroad agency. Due to its informative website, outstanding counseling, and comprehensive free services, Online Ryugaku Support Center quickly expanded to include Study Abroad Support Centers in many of Japan's major cities. In addition to assisting students with placement at overseas language schools, vocational schools, high schools, and universities, Online Ryugaku Support Center provides comprehensive student support in areas such as visa procurement, pre-departure counseling, and travel accommodations. 1. As a member of the ALC Group of companies (headed by ALC Press, Inc.), we maintain a tradition of superior service and reliability. 2. Having published the study abroad guide 'Ryugaku Jiten' and supported students through our overseas network for over 20 years, we have gained a wealth of knowledge about the study abroad industry. When we pass on information to our students, they can be confident that it is up-to-date and relevant. 3. From short-term parent-child programs to foreign university and graduate school entrance, we support our clients' diverse needs by offering an unprecedented array of study abroad programs. 4. Online Ryugaku Support Center Education Network offers free placement and registration services for both language and vocational schools. 5. In addition to offering free university acceptance assessment support, we provide reasonably priced support for programs such as Guaranteed University Acceptance and the University Scholarship Program. 6. We offer comprehensive pre-departure support, including unique and effective preparatory English language materials and instruction. 7. For students planning to visit China, we can offer a variety of both short and long term programs. 8. In addition to being well informed about numerous programs and study abroad options, our counselors have themselves all had the experience of studying abroad. Furthermore, our expert staff includes native speakers of Japanese, Chinese and English. This has allowed us to eliminate misunderstandings and communicate better with our international counterparts. 10. Online Ryugaku Support Center Education Network is proud to offer unique scholarship opportunities to qualified students. Because we understand that each student has a specific budget for studying abroad, we always do our best to accommodate their economic needs. 11. We research programs and visit schools so that we can give students accurate and practical information. Our staff has personally visited or met with representatives of a majority of the programs that we send students to. This allows us to better match students with institutions. Online Ryugaku Support Center Education Network takes pride in working with superior schools.